I wanted to take a quick moment to let you know about a great offer for a free family Bible study. 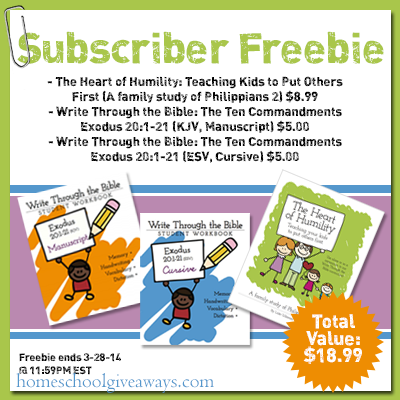 Subscribe to Homeschool Giveaways and you can get a free Write Through the Bible bundle until March 28th. 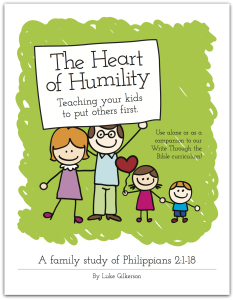 Included in the bundle is the family Bible study, The Heart of Humility! The Heart of Humility is a 30-lesson family devotional that helps your children understand the importance of putting others first. Focusing on Philippians 2:1-18, the study unearths a dozen biblical motivations for why we should strive to be humble. Most importantly, the study focused on the ultimate example of humility by studying the incarnation and death of Jesus Christ. And if you subscribe to Intoxicated on Life, you can also download free scripture memory cards (among many other freebies) to accompany this Bible study for your family. The free Write Through the Bible bundle also includes The Ten Commandments (Exodus 20:1-21) manuscript and cursive copywork printables that include handwriting, dictation, vocabulary, and Scripture memorization. Even if you don’t homeschool or don’t typically use copywork, this is a good way to memorize scripture and get in some extra handwriting practice. Maybe a summer activity to keep skills sharp? I’ve always been pleased with Intoxicated on Life’s resources and I’m sure you will be as well!